Perhaps most who read about this event will not be alarmed. But I was because I see the significance. I know that what Chuck Smith and Calvary Chapel once stood for is not at all what Hybels stands for. 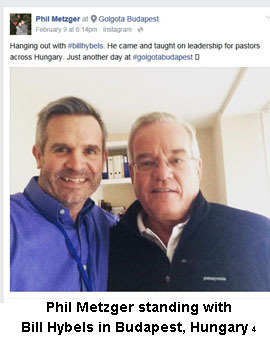 Bill Hybels was mentored by Peter Drucker along with Rick Warren to “reshape” Christianity for the 21st century. Hybels, from the famous Willow Creek Church located in South Barrington, Illinois, fathered the “seeker-friendly” movement. When Hybels and his cohorts discovered that the seeker-friendly model produced spiritually illiterate believers, they said they “repented”  from this model of church; but in actuality, they delved right into teachings associated with the emergent church and contemplative mysticism, seeing those as the next “great” step. Interestingly, on Metzger’s Facebook page, someone defending Metzger’s promotion of Hybels said that it was irrelevant to talk about the emerging church because it was no longer an issue. But nothing could be further from the truth. While often called other names now, such as progressive, the ideologies of the emerging church are very much at work today. Click here to read this entire article and for endnotes.